I'm 46 year old marathon runner. I've known Breeze for a couple of years now. We first met at a local gym we both had memberships at. From previous conversations I knew he was a personal trainer and owned his own company but I didn't know him well. We usually just greeted each other as we passed by. Back then I only had one focus-training for marathons. I would spend an average of 3-5 hours a day at the gym using the different machines, like the stair climber, to build up my strength and endurance to run. One day as I was on the stair climber Breeze approached me and offered his services. I wasn't interested at first and for the longest time I gaffed him off. Then I started to get frustrated. I've been running these marathons for a few years now and the same lady keeps beating me. She's 64. It wasn't by a lot either but she kept doing it, no matter what I did or how I trained. I finally asked Core Identity for help. I told them I wanted to cut 15 minutes off my time just so I could beat this lady. Breeze promised me that he could help and that I would be fantastic. When we first started training I was a bit resistant to Breeze. I'd been training for so long by myself and all of a sudden here's breeze telling me I was doing it incorrectly. He got me off the machines at the gym and had me start lifting weights and stretching. He told me I was running too much, I was literally running over ten miles a day, and asked me to take a day to rest. To me that was ludicrous. Why would I rest when I'm training for a marathon?! He also had me changing my diet and eating a more balanced meal. I started, slowly, following his advice. I did stay off the machines at the gym and I started lifting free weights and for the most part I ate what he said I should. I kept running though. One particular day I left to run a quick 14 miles. I realized when I was done that I had cut 45 minutes off my usual time. It left me in shock. That was just 14 miles-I couldn't wait to see how I'd finish my marathon. 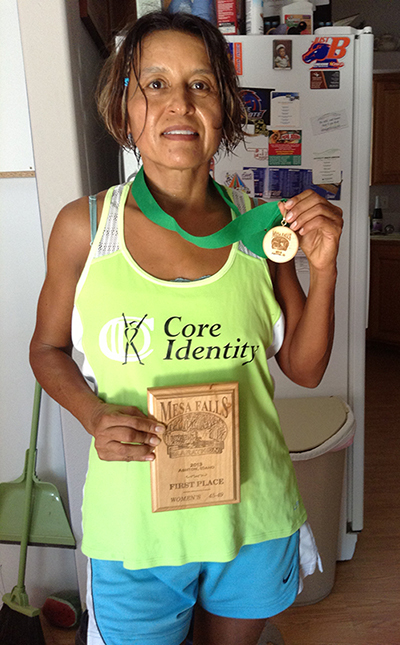 In August I ran the Mesa Falls marathon. I won for my age group! Not only did I win but I cut off an hour and 25 minutes off my time. When I ran that same marathon the previous year I finished it in 4 hours and 30 minutes. This time I came in at three hours and five minutes. This marathon was completely different than the last marathon I ran, before I started working out with Core Identity. My last marathon left me in pain and exhausted when I was done. At mile 20 I felt like I hit a wall. I was exhausted, my legs were cramping, and I started crashing. I barely finished the race and when it was done I could barely walk my legs hurt so bad. I felt like I was 81 years old instead of 46. This marathon was completely different. There was no wall, no cramping, and I actually felt like I was flying instead of running. The last three miles, which were all uphill, I actually picked up speed and ran faster than I ever have before. When the race was finished I was in no pain or cramping whatsoever. I could have kept running I felt so good. Since then, there's been a noticeable change in my body. I'm more flexible but also way stronger than I was. My body is more toned and everyone is noticing-all my friends and family are constantly telling me how much better I'm looking. I couldn't be happier with the services that I'm getting with Core Identity. I'm now fully committed and I follow their advice to the letter. They've kept their promises to me and have proven that they know what they're doing. As a result- I am fantastic and am very excited for my next marathon on October 6th in St. George!